“We are in touch with Turkish officials, who assured us that there will be a thorough and comprehensive investigation [into the case],” Zakharova said. The perpetrator, who was wearing a suit and a tie, shouted ‘Allahu Akbar’ (‘God is great’ in Arabic) during the attack. “Only death can take me away from here. Whoever has a role in this cruelty, they will pay for it one by one. They will,” the man went on to say. Since last year, Russia has been providing Syrian government forces with air support in their fight against terror groups and rebels. Turkish NTV broadcaster says that three other people were also injured in the attack on the ambassador. The attacker himself has been killed by Turkish Special Forces in a shoot out that followed. The gunman was a police officer, Turkish Interior Minister Suleyman Soylu confirmed. 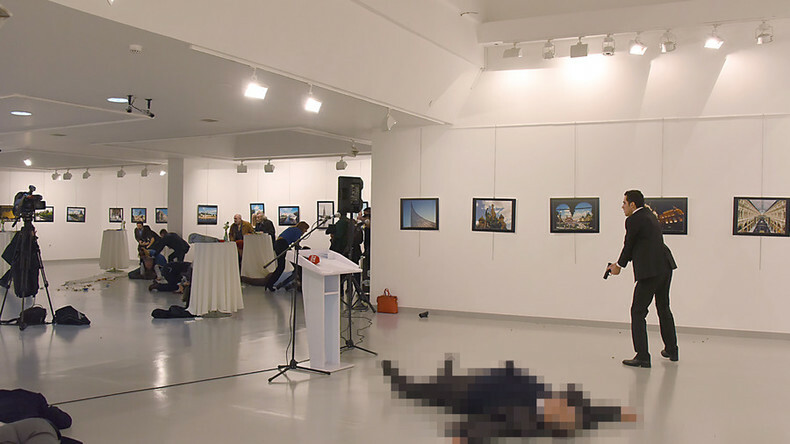 Previously Interfax, citing a source in the Turkish military, reported that the perpetrator had presented a police ID as he entered the exhibition. Meanwhile, a picture allegedly showing the perpetrator’s personal file, apparently proving he was indeed a police officer, was posted on social media. Reacting to the assault on the Russian ambassador, the US State Department expressed its condemnation. “We condemn this act of violence, whatever its source. Our thoughts and prayers are with the victims and their families,” State Department spokesperson John Kirby, wrote on his official Twitter account. The attack on the ambassador might be an attempt to jeopardize relations between Moscow and Ankara, Russian MP and member of the International Relations Committee, Elena Panina said. “I believe that this is a provocation to disrupt improved dialogue between Russia and Turkey. Moreover, we know that [Turkish President] Erdogan is due to visit the Russian Federation. Therefore, it is a pure provocation,” Panina told RIA Novosti news agency. Speaking to RT, Russian Foreign Ministry Commissioner for Human Rights Konstantin Dolgov said that the death of Karlov was a huge loss.